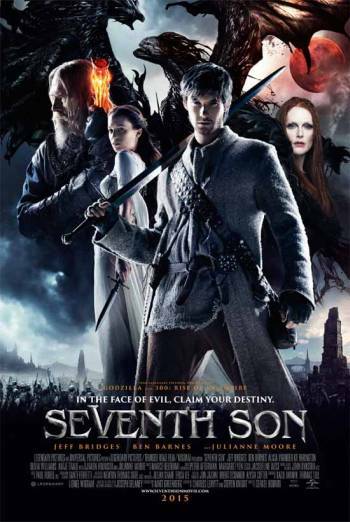 Summary SEVENTH SON is a fantasy film about a man with powers he must use to protect his country from supernatural creatures, and who must now find an apprentice. SEVENTH SON is a fantasy feature about a man with powers that he must use to protect his country from supernatural creatures. He needs to find an apprentice to continue his work, and attempts to train up a farmer's son for the job. Moderate fantasy violence includes several characters being injured and killed; rather than reacting in a realistic way, they glow and disintegrate. There are some lengthy fight sequences, with threat from magical powers and dragons, as well as weapons. One of the stronger images is of a man being killed by being set on fire, but this is shown briefly and without any dwelling on it or on sight of the body afterwards. There is a single use of strong language ('f**king'). There is also occasional very mild bad language, including uses of 'damn', 'dammit' and 'hell'.